FiberAlchemist - it looked familiar, I used the same size/color moleskin notebook to gelli print the cover for the one I sent Abbeeroad. I have a cricut - I've been nervous about trying vinyl for some reason. Abbeeroad - I spent a couple days making tons of stencils. The small ones hold up better - the larger ones were kinds floppy and tore easier. And as you use them, layers of paint will just help make them last longer! 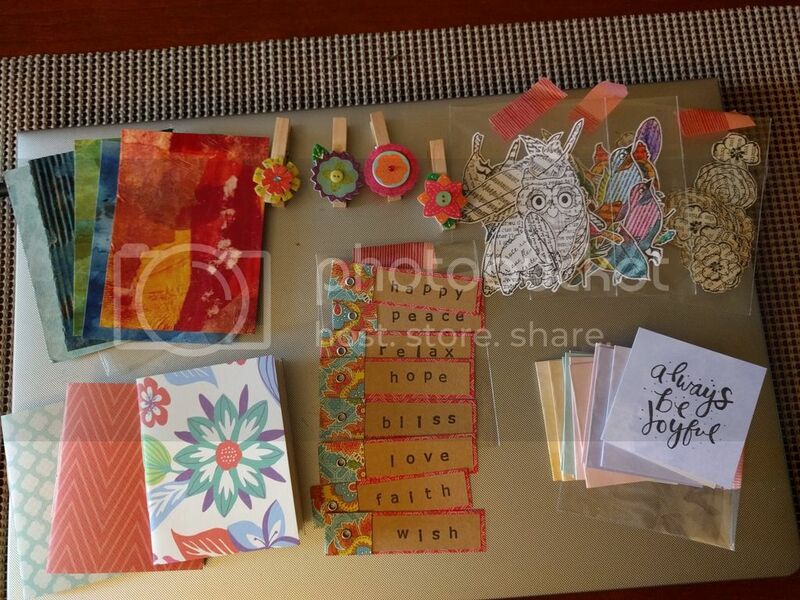 I have been on a gelli printing spree and have been gelli printing all kinds of things. 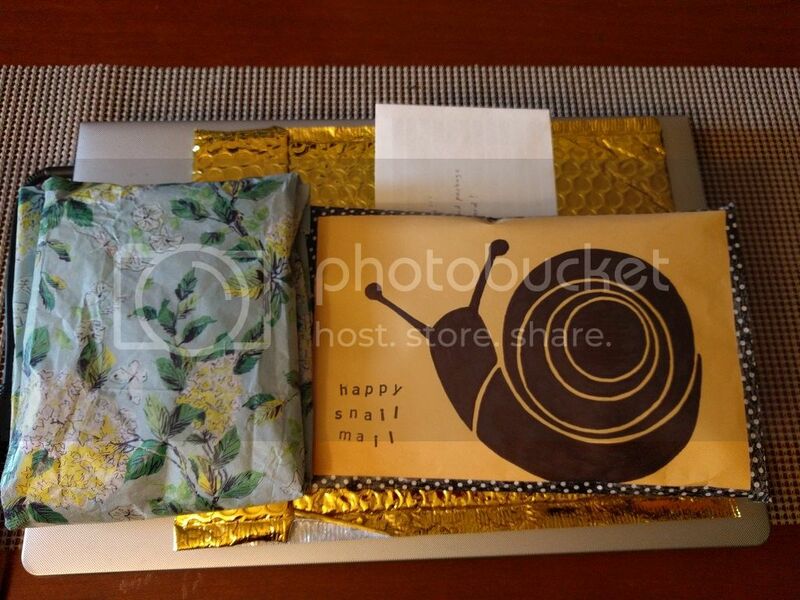 The snail on the snail mail package is super cute! mlsocci74 the journal looks really good. All the note cards people are making are great. I esp like the ones with the African animals on them. Good points! I'll remember that! Can't wait to play with them. 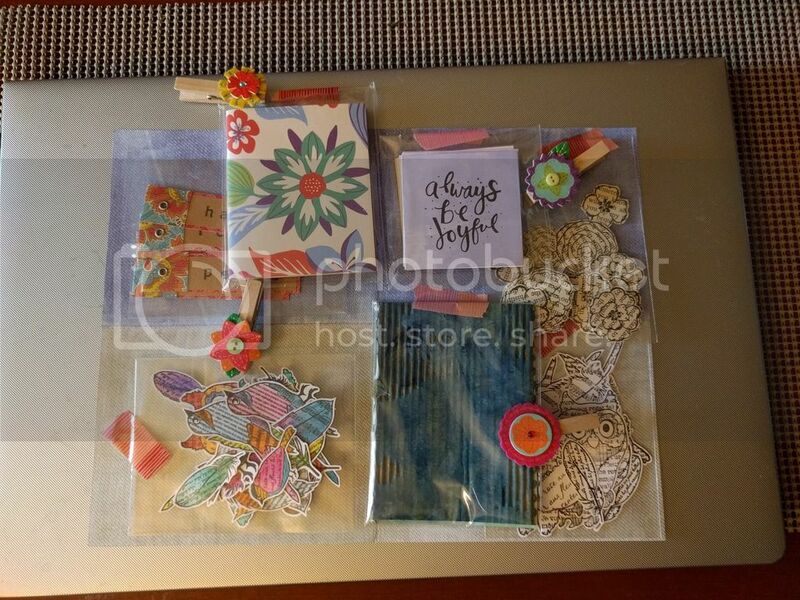 All the gelli print stuff you made was awesome! SUPER COOL package from FiberAlchemist. Love the notebook and the style of the inchies (though I don't get the reference)! rosie - thanks for the compliments. abbeeroad - love the tag and stencils. thanate - That pocket letter is too cute. Never seen one in person myself. lol Also the tags and cards from bec are too awesome!! jillybeans - I adore the notebook and inchies. geekgirl - thank you. The snail is in the cricut design space. He is too cute. and thank you regarding the notebook. I love the "snail mail" art - that's so adorable. And what a great collection of fun crafty goodies!! So much to play with . 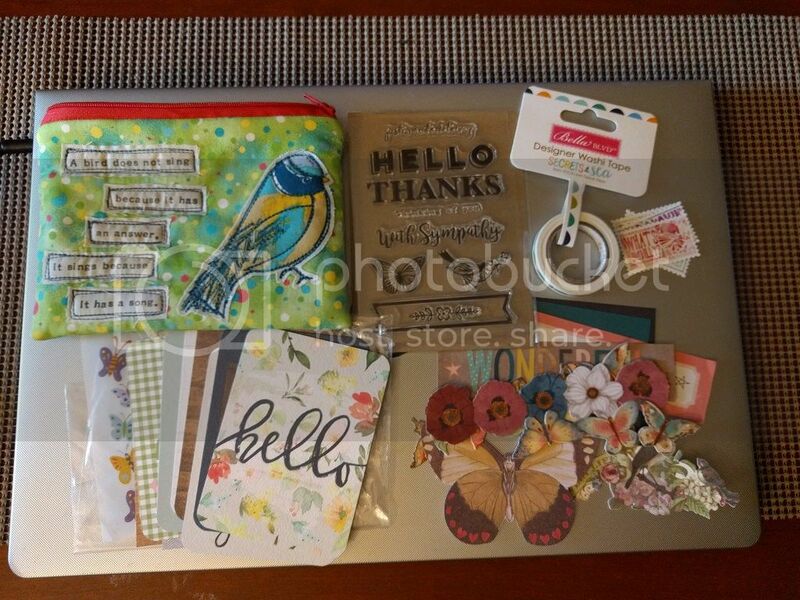 All the gelli stuff is AWESOME. I actually really love those gelli stencils too - I would probably frame them just as-is!! That whole sheet of ATCs...whoa. Amazingly cool. It must have been so fun going through each of them. I'm a sucker for bunting and cute little tags too. They get me every time!! Great to have around for gift giving and even swapping. I adore all of those sweet little colorful drawings!! I don't understand all the references but don't need to to know they are super cute. Great stuff!! Can't wait to see more happy!!! Here is my awesome package all the way from Australia from bec. Stickers, mini cards, standard cards oh my! and unicorns!!! Thanks girl, I love it all!!!!!! There are so many beautiful packages coming in. I love all the mixed media work! The gamer notebook is adorable. I love the hand drawn work a few people did. There's too much greatness to mention! I got my package from loves2experiment and holy moley!!!! I already took some pictures now I just have to figure out how to post them! Wooooooo! Ok, so I got THE BEST package from loves2experiment today. What a treat! She completely spoiled me! She took my themes of nature/greenery/flowers etc as well as positive sentiments and absolutely ran with it! I want to apologize for my less than stellar. The lighting isn't great and I had trouble really capturing the awesomeness! First of all it arrived in a beautiful shiny gold envelope and inside THAT was a little bundle wrapped in pretty tissue paper as well as a hand decorated envelope with an adorable snail mail snail on it! Next I opened the other envelope and this was filled with all the handmade goodies! It was packaged so cutely with all the goodies in little baggies with washi but they got jossled so I'm not sure where they were originally in the package. 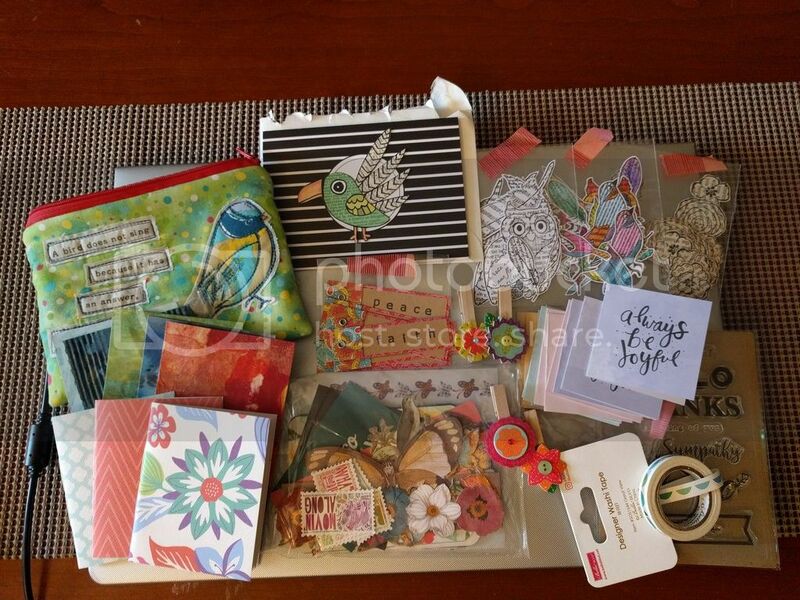 There were three packages of decorative cut outs in bird, feather and flower shapes. Some she colored and some she left for me to color! Another bag with lovely hand decorated papers that will be great for making ATC's. One with 3 little handmade notebooks which are going to be great for jotting down notes. One baggie of a whole stack of little cards in different colors with the sentiment 'Always be joyful' on them (which I love). There were also a bunch of really really beautiful tags with positive or inspiring words on them. I love them. I have no clue what I am going to do with them but I kind of want to just sit and look at them lol. There were also these really adorable decorated mini clothespins! WHAT A TREAT! Here's a picture of the whole shebang along with the card she made(?) ! I cannot emphasize how much I LOVE everything. I feel so lucky! What a great happy mail package and a perfect first swap! Yesterday I received both of my bits of happy mail! and the back. I love that it's so bright and cheerful! There were also some hand made return address label and some Harry Potter book altered paper clips (which you can see in some of the pictures). Thank you Rosie1981 for such a lovely and thoughtful package! And here is what jillybeans sent. An envelope, complete with a fire breathing dragon! There were two vinyl decals. They are kind of hard to see because they're white; but one is the Deathly Hallows symbol and the other is the Critical Role logo. Now I just have to decide where to stick them. More stickers, this time black cats. And a little felt badge. An awesome painting of a Porg and a Beholder. And lastly some Harry Potter extras. Thank you jillybeans for such a delightfully nerdy package! This was the notecard - it's so pretty. I gave me ideas of things to try with my Cricut. Lots of goodies: 2 vinyl decals combining Doctor Who and coffee! awesome! I can't wait to put these on some mugs. a cute little cat stamp. I will probably be stamping all my mail with cats now. and some cool gelli printed tags. Cat faces on paperclips! These were super cute. Bookmarks. And FABRIC coffee mug stickers. I would have never thought to make fabric stickers. They are really cool.